The Intercontinental GT Challenge series debuted in 2016. The idea behind the championship is to reduce expenses by using local cars and teams. Drivers and engineers from around the world participate in the events but costs and time would be reduced by not having to ship equipment to the four different continents where the races were held. 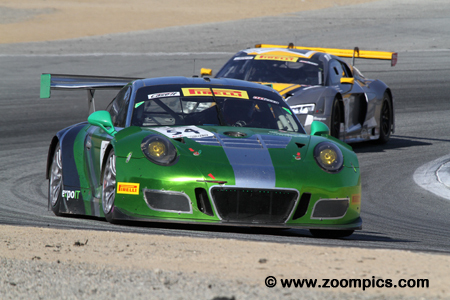 The California 8-Hours is the third of four events during the 2017 Intercontinental GT Challenge season. The first race was at Bathurst, Australia in February. In July, the series competed in a 24-hour race at Spa, Belgium. The final round takes place at Sepang, Malaysia in December. The starting grid included many of the top Pirelli World Challenge teams (K-PAX Racing, TRG, GMG Racing, Ian Lacy Racing, Magnus Racing, Black Swan Racing, Wright Motorsport and RealTime Racing). Mazda Raceway Laguna Seca hosted this event. The inaugural California 8-Hours would be the longest professional race conducted on the 60-year-old 2.238-miles eleven-turn road course. 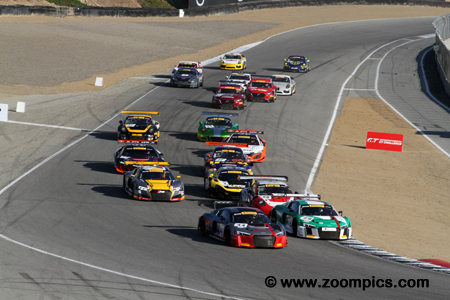 Nineteen competitors dive into Mazda Raceway Laguna Seca’s corner two for the start of the California 8-Hours. Leading the way is the pole-winning Audi R8 LMS from Land Motorsports. 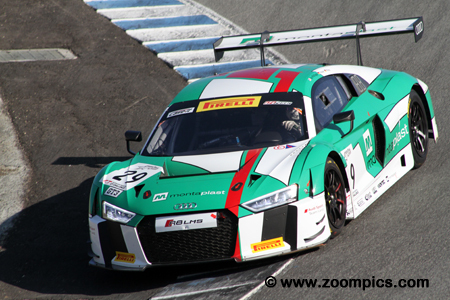 Challenging the Audi on the outside of the turn is the second fastest qualifier entered by Magnus Racing. Maintaining their starting positions is the remainder of the GT3 grid. 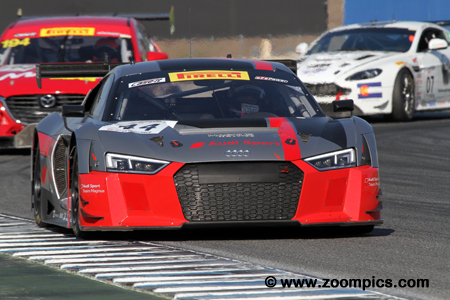 Representing Audi North America was the Pirelli World Challenge team Magnus Racing which entered the No. 44 Audi R8 LMS. The car was shared by Kelvin van de Linde, Markus Winkelhock and World Challenge regular, Pierre Kaffer. Winkelhock was selected to qualify the Audi and he was second quickest. Van de Linde was in the car for the final stint and passed the leader in the last twenty minutes of the contest to give the team the victory. MARC Cars Australian entered two Mazda 3s in the Invitational class. The Mazdas were powered by a 5.0-liter Ford Coyote Motorsport engine producing 500-horsepower. The two cars ran in tandem for the entire eight-hours. But it was the No. 193 car raced by Jake Camilleri, Hadrian Morrall and Morgan Haber out front at the checkered flag. The trio won the Invitational category by over a minute. Black Swan team principal, Tim Pappas abandoned his regular ride, the Mercedes AMG GT3 in favour of the Porsche GT3 R that he campaigned during the 2016 season. Joining Pappas were Jeroen Bleekemolen and David Calvert-Jones. Bleekemolen qualified the Porsche seventh quickest but topped the GT3 Pro/Am category. A steady performance during the eight-hours resulted in a fifth overall and the class victory. The No. 29 Audi R8 LMS was entered by Land Motorsports and driven by Californian, Connor De Phillippi, Christopher Mies and Christopher Hasse. Hasse performed the qualifying duties and put the car on the pole. The trio dominated the race until the final hour when they were challenged by the Magnus Racing entry. Mies was passed by Kelvin van de Linde in the closing stages – finishing 2.489-seconds behind the winners. 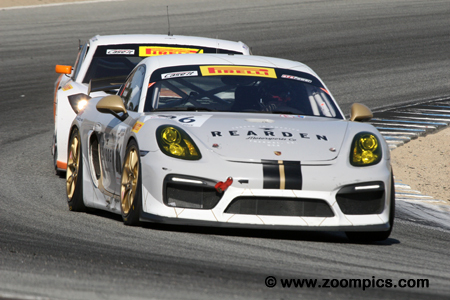 Utah based Rearden Racing entered two Porsches. The more successful of the two was the No. 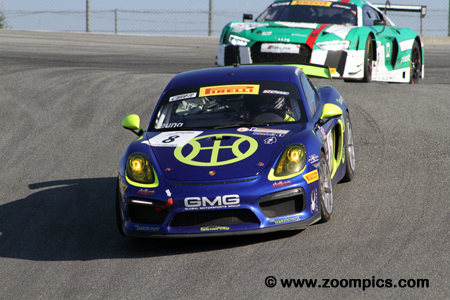 26 Porsche Cayman GT4-R driven by Jeff Kearl, Jeff Westphal and Sean McAlister. 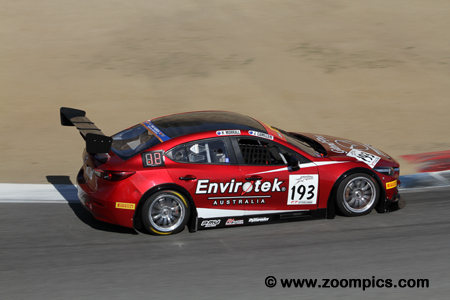 The team was gridded sixteenth overall and fourth in GT4. The class-leading TRG Aston Martin encountered brake problems in the sixth-hour which allowed the No. 26 Porsche to inherit first place in GT4. They would finish eleventh overall and first in their category. 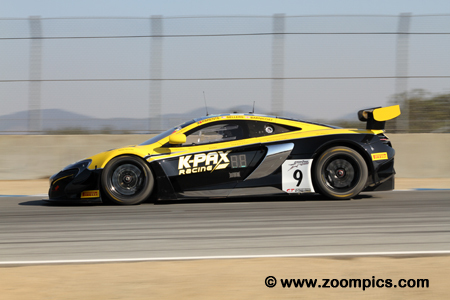 Another Pirelli World Challenge team with an entry in the California 8-Hours was K-PAX Racing. The McLaren 650S GT3 was driven by series regulars Bryan Sellers, Ben Barnicoat and 2016 champion, Alvaro Parente. Parente qualified the McLaren and recorded the fifth quickest time. The K-PAX team was able to match the pace of the Audis but could not challenge them for the victory. They were the last car on the lead lap and finished third overall. GMG Racing entered a Porsche Cayman GT4 Clubsport MR for Carter Yeung, Jon Miller and Andy Lee. The trio was seventeenth on the starting grid and fifth in the GT4 category. During the eight-hours, they chased the TRG Aston Martin and Rearden Porsche. They moved to second in class when the Aston Martin developed a brake issue. 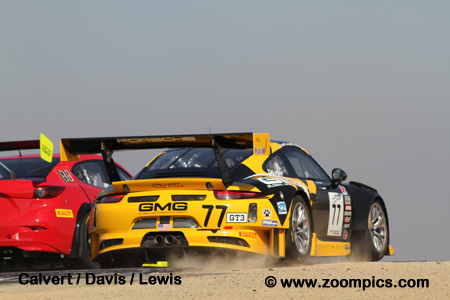 At the checkered flag, they were twelfth overall and took the runner-up spot in GT4. 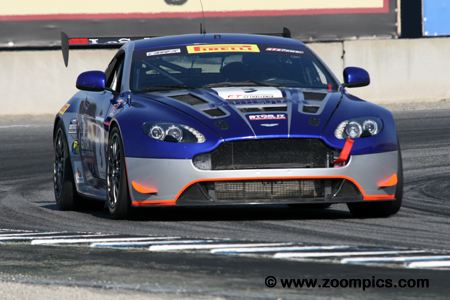 Endurance veterans, The Racer’s Group, entered two Aston Martin Vantage GT4 machines. The No. 07 entry was the quicker of the two Aston Martins and started on the GT4 pole. Unfortunately, the car encountered problems during the race and it was the No. 3 entry that upheld the team’s honour. The second entry was driven by Kris Wilson, Craig Lyons and Thomas Merril. The trio finished thirteenth overall and third in class despite a brake issue.